For the filling: Mix walnuts with white lotus paste. Divide into 6 portions of 45g each. Divide red dragon fruit lotus paste and black sesame lotus paste into 45g portions. 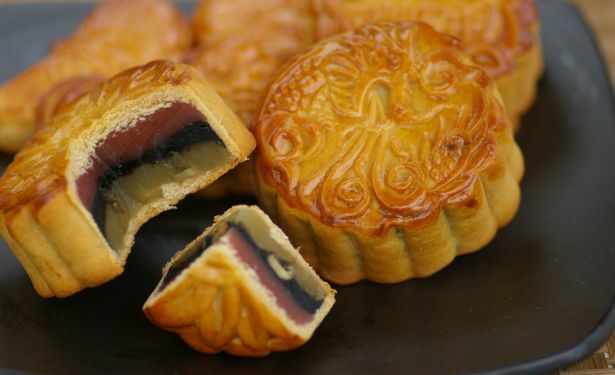 Layer the filling: White lotus paste on the bottom, black sesame paste in the centre, dragon fruit lotus paste on top. Round up these 3 layers carefully into a ball of filling. For the mooncake skin: Put golden syrup into a mixing bowl. Stir in alkaline water and bicarbonate of soda to mix. Add corn oil then leave aside for 1 hour. Sift in flour and mix into a dough. Cover with cling film and set aside for 2-3 hours to rest. If dough is still sticky and too soft, mix in the extra flour. Scale the dough into 45-50g portions. Roll out the dough and wrap each portion around a ball of filling. Dust a mooncake mould with some flour and knock out the excess flour. Press the prepared portion of dough into the mooncake mould. Knock the sides of the mould gently to dislodge the mooncake. Arrange the mooncakes on a greased baking tray. Bake the mooncakes in preheated oven at 180°C for 10 minutes. Remove the mooncakes from the oven and brush with egg wash. Return the mooncakes to the oven and continue baking for 10 minutes.